I decided to detour a bit today. 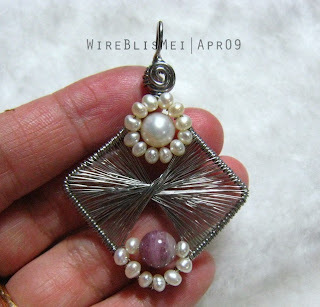 Just need to try this out....the Peruvian String art....a hot topic in the wire jewelry forums that I am a member of for the last weeks. What I learned from this first try is that the coil that I made is too fine. So, if you are thinking of trying this out, make a bigger coil and space them further apart. Otherwise, you will end up using lots....yeah! lots of wire, like me. Overall... I love this string art...give it a try and you will be hook. 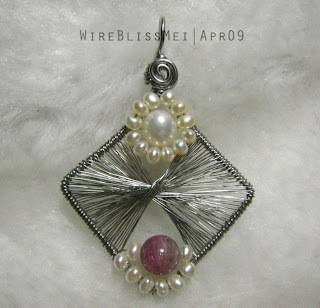 Now that is a fascinating "twist" on wire work. Thanks for sharing. I love this I hope that you will create a tutorial for this. It is fantastic! This is INCREDIBLE. I love it and would love to learn how to do it!